The Claims for Henry Livingston, Jr. The late Dr. William Livingston Thomas (1871-1941) devoted thirty years in quest of evidence to prove that Henry Livingston, Jr. wrote "The Night Before Christmas," as Dr. Thomas called "A Visit from St. Nicholas." There has been sporadic attention to the problem on the public's part when a newspaper or periodical has played it up from time to time. Such notices have increased in recent years. Dr. Thomas was sincere, earnest, indefatigable. The results of his efforts merit extended reference. He was born in Poughkeepsie. He was the great-grandson of Henry Livingston, Jr. Educated in medicine at George Washington University, Washington, D.C., he practiced for many years in New York City where he rose to eminence in the field of allergy. Dr. Thomas's leisure time pursuit was historical and genealogical research. Among his activities was his interest in the New-York Historical Society and in the Society of the Order of the Cincinnati. He wrote a number of books on botany, history, and medicine, besides many magazine articles. His major preoccupation, however, was with his family's claims in behalf of their forebear. The American Livingstons derive from Robert Livingston of Scotland, who established the family in the Hudson River valley in the latter part of the seventeenth century. His estate embraced, roughly, Dutchess and Columbia counties. The two most prominent early Livingstons were William Livingston, Governor of New Jersey in Revolutionary days, and Robert R. Livingston, distinguished chancellor of New York, the highest judicial post in the state. It was Chancellor Livingston who administered the presidential oath to George Washington at Federal Hall on April 30, 1789; Clement C. Moore's father, the Rev. Benjamin Moore, we recall, participated in a minor role. Henry Livingston, Jr. was therefore of worthy ancestry. The great-grandson of Robert, first "lord of the manor," he was born in 1748 at "Locust Grove," south of Poughkeepsie. He lived there most of his happy-hearted, pious, and useful life. Not much about his boyhood has survived. Though once a member of a Tory social club before the Revolution, he became a staunch patriot. He suggested "God save the Congress" for "God save the King." In 1775 he joined up with General Richard Montgomery, who had married the beautiful Janet Livingston, and served with him in the ill-fated expedition to annex Canada as the Fourteenth Colony. Henceforth he was Major Livingston. At various times, he served also as justice of the peace, Federal assessor, and city clerk of Poughkeepsie. [incorrect: the city clerk was his father] In brief, he was a man of considerable local distinction, overshadowed, however, by his more glamorous nephew, "Colonel Harry." When Major Livingston died in 1828, his widow penned this moving tribute: "...I view my beloved husband as ascended to the Mansions of our dear Redeemer...Our pilgrimage will soon be over, and through Divine Grace...we may all be united never to be separated..."
Major Livingston, it seems, was a dabbler in verse all his days, as many another was in his time. Nevertheless, there is not a word from his own pen upon the authorship of "A Visit from St. Nicholas." No one, outside his family circle, appears to have heard of his having written the poem. Mr. Henry Litchfield West, who has gone into the problem pretty thoroughly, observes that the family's unwillingness to permit their belief of a century's standing to be made known restricted popular interest in Major Livingston until the late Dr. Thomas's day. Dr. William Stephen Thomas, Dr. W. L. Thomas's son and the present director of the Rochester Museum of Arts and Sciences, now possesses the Henry Livingston Jr. papers. In a letter to me, dated November 13, 1953, he writes that "among the various written family documents" is one in which Jennie Hubbard states quite definitely and unreservedly: "Of course Grandfather Livingston wrote "The Night Before Christmas." I believe it just as much as I believe Burns wrote "Tam O'Shanter." Father [Charles P. Livingston] knew when and where he wrote it, and that he read it at home before he sent it to be published in a Poughkeepsie paper. Father had the paper carefully preserved, but, alas, I am grieved to say, it is now lost." According to Mr. West, above cited, other members of the Livingston family support Mrs. Hubbard and Mr. Sidney Montgomery Livingston. Some time ago, Mr. Henry Livingston of Babylon, L.I. declared that as long as he could remember, his father maintained that Major Livingston had written the lines generally attributed to Clement C. Moore. The same grandson also said that the verses were first read to the children at the old homestead south of Poughkeepsie, about 1804 or 1805. Mr. Livingston's father, he further stated, had given the original manuscript to another son, Edwin, whose personal effects were destroyed when his sister Susan's house was burned down at Waukesha, Wisconsin, in 1847 or 1848. Probably the best case for the Livingston claim was made by the late Dr. W. L. Thomas. It appeared in the Year-Book of the Dutchess County Historical Society for 1919. [Correction: middle initial S, not L] He strongly stressed internal evidence. Henry Livingston, Jr.'s manuscript book, he stated, contains 44 metrical compositions, religious, elegiac, satirical, domestic, and social. Unfortunately, the poem in question is not one of the 44. Next day all the world with the Major must dine. To guzzle bahea and destroy bread and butter. [Correction: Wow! talk about transcription errors. The changes aren't just punctuation. The late Dr. Thomas observed that "Major Livingston liked nature and drew pictures for his children...Some of his verses were printed in the monthly issues of the New York Magazine and Literary Repository between the years 1791 and 1794. Occasionally, the poet's original notes refer to his pictures or stories. 'Twas the night before Christmas, when all through the house, Not a creature was stirring, not even a mouse. ...A critical comparison of the 'Visit from St. Nicholas' with the acknowledged verses of Henry Livingston adds internal evidence supporting the correctness of the family tradition." Director Thomas puts this addendum to the words of his distinguished father: "As you know, the common thought is that the poem first appeared in the Troy Sentinel, December 1823...anonymously. However, the Livingston family gave oral tradition and written that it was published considerably before that in a Poughkeepsie paper where so many of Livingston's verses appeared. A fairly careful search was made by my father of all surviving Poughkeepsie newspapers, but he never found it. However, since he searched in the 1920's and 1930's, it is quite possible missing numbers have turned up..."
The W.L. Thomas Papers in the New-York Historical Society yield nothing substantial to support the Livingston family tradition. Through all my life a student of Chelsea, its church, its seminary, and Clement C. Moore, I never heard of Henry Livingston, Jr. as the reputed author of "A Visit from St. Nicholas" until the late rector of Christ Church, Poughkeepsie, Dr. Alexander G. Cummins, sent me an article by the late Helen Wilkinson Reynolds, supporting the Livingston claim. Dr. Cummins asked me for comment. I gave it in a letter which he printed in The Chronicle, of Poughkeepsie. I received no replies. Through these many years nobody else but the family seems to have heard of Major Livingston as the author of the famous verses. Philip Hone, George Templeton Strong, and others gave Moore the credit. 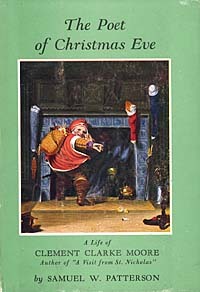 Anthologists like Edmund Clarence Stedman, a conservative if ever there was one, have included "A Visit from St. Nicholas" with Clement C. Moore named as the poet. Van Wyck Brooks, eminent critic and literary historian, sees no reason to think that any one else than Moore wrote the verses. Chelsea memories going back to Moore's times have never countenanced any other author of "A Visit." Let it be added in conclusion that the claims of various localities - Claverack, Sing Sing (Ossining), Newport, and Newtown, L.I. - have been advanced as the birthplace of "A Visit from St. Nicholas." There is not a shred of worthwhile evidence to substantiate the claim of any one of them. This is actually fascinating. He (inaccurately) repeats the large burden of the claims and then makes no argument against them other than that (1) no one he knows has heard of Major Henry; (2) it was published under Moore's name by an editor; and (3) a historian says there's no reason to worry. Sure does a number on constructing logical arguments. The main argument - that Moore said later in his life that he wrote it - Patterson doesn't even bring up!